Midfielder Francesc Fabregas has squashed all speculation of his eventual departure from Arsenal this season by commiting himself to the North London club. It was revealed that the Spaniard was happy at Arsenal but mainstream media still persist in publishing stories about his departure from the club, mainly due to a lack of trophies. Now, the midfield maestro has come out and pledged his future to the Gunners, saying that he was focused on winning trophies with the North London club. Fabregas said: "It's only the beginning of the season. "We started well last season and were first for a long time so now it doesn't matter. "All we can do is focus on the next game and learn from our mistakes. "We've made a lot of mistakes on set pieces and defending and if we really want to win something then our attitude has to change. "I want to stay here because this is the best place for me to stay. "I want to win trophies here and I hope we can do it this year." Arsenal sent representatives to watch Mevlut Erdinc back in May and since then he has been closely monitored by the north London club. Mevlut Erdinc was born in France but has Turkish parents, His nickname is “The Turkish Tank” and opted to play for Turkey and now has 8 capts. In his first season with Sochaux he became the club’s top-scorer with 11 goals in 28 appearances. His current contract with the French side lasts until June 2009. And Arsenal could steal the TANK for next to nothing in the summer. Arsène Wenger will look at himself more than his players for the reasons behind Saturday’s shock 2-1 defeat at home to Hull City. On a dramatic, unpredictable afternoon at Emirates Stadium, the aptly-named Tigers came from behind to inflict only Arsenal’s second defeat in more than two seasons at their ‘new’ home. Wenger is a football obsessive who has been known to stay up into the early hours to review that day’s victory. He once admitted that during his early career in France he had to stop the team bus to be physically sick after one bad loss. Therefore you can only imagine his reaction to the deep disappointment of Saturday. “I always look first at myself after defeats,” he said. “Don’t worry about that. We do that with all the staff. “You think about the game and, if you can watch it, you watch it again. “But there were certainly enough ingredients in the game to make me physically sick again. “We had an opportunity to go top of the League and in that situation you have to be right in your intensity and in your concentration level. That ‘electric level’ in our head was not high enough. Arsène Wenger has confirmed his side will be without Samir Nasri against Hull on Saturday after the 21-year-old failed to recover from his knee problem. The Frenchman picked up the injury whilst on international duty earlier this month and remains on the sidelines with long-term absentees Tomas Rosicky, Abou Diaby and Eduardo. Arsenal.com says Gael Clichy will be ready to play at Emirates against Hull City this Saturday. After tests, they confirmed that he only suffered a bruised shin. He has missed training all week but returned on Thursday. 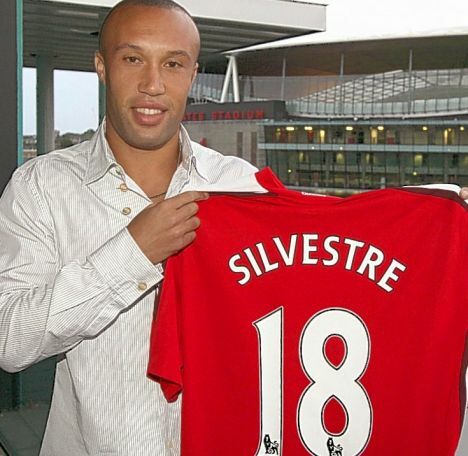 His new French teammate, Mikael Silvestre, will also be available for the first time following his move from Manchester United. United and Chelsea have shared the title for the past four years but Ferguson believes the clash with Arsenal is still the bigger game because of their histories. Ferguson said: “If you look back over the last 12 or 13 years, who has it been? Arsenal v Manchester United, Manchester United v Arsenal. “Of course we’ve got Chelsea at the moment — that’s without question. 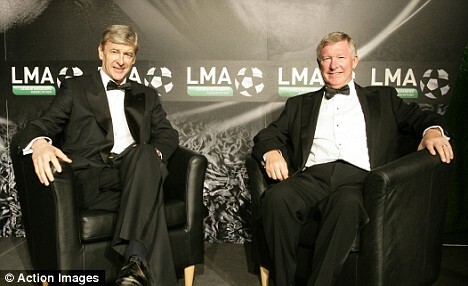 Fergie, quoted in The Sun, added: “There’s a dominance attached to that. You want to be the dominant team and they want to be the dominant team — we’ve had some volatile matches because of that. Arsenal takes top seat in the Premier League with a 3-1 win at Bolton. Samir Nasri picked up a knee injury on international duty earlier this month while Abou Diaby (thigh) has not featured since the Emirates Cup. Mikael Silvestre (muscular problem) has yet to make his Arsenal debut and all three players will have to wait a little longer for first-team action. 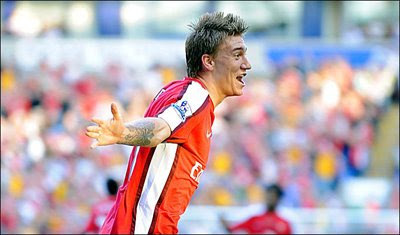 "The good news from last night is that nobody has come back with any knock or severe injury," said Wenger. "We have no injuries from last night and we have no-one coming back as well, so the group will be stable. "For Diaby, I would say two more weeks [until he is fit], Silvestre and Nasri should be available for Hull [at Emirates Stadium on September 27]." Arsenal will be without Samir Nasri and Mikael Silvestre for their UEFA Champions League opener on Wednesday. The duo have failed to shake off injuries in time to join their team-mates on a tricky trip to face Dynamo Kiev. 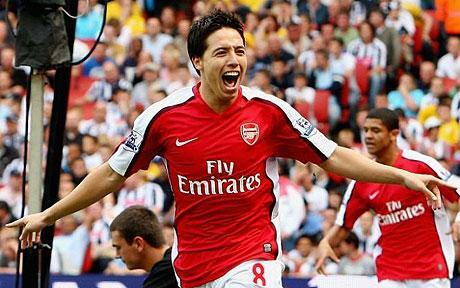 Nasri sat out the Gunners' weekend win at Blackburn with a knee problem, while Silvestre is yet to recover from a thigh strain which has prevented him from making his debut for the club. While Arsene Wenger will be forced to cope without the guile and experience of his French duo, he has been bolstered by the news that Gael Clichy and Emmanuel Eboue are both fit for the European encounter. The pair had been doubts ahead of the journey to the Ukrainian capital, but have been included in Wenger's travelling party. That means the Gunners have made just one change to the squad which secured a comprehensive 4-0 success at Ewood Park on Saturday, with Mexican striker Carlos Vela taking the place of youngster Kieran Gibbs.